The video production facilities at NetApp, a data management and enterprise storage solutions company, needed a refresh. Based in the multinational company’s headquarters in Sunnyvale, CA, the studio is used to produce hundreds of live and recorded programs for employees and clients annually. The Sunnyvale campus produces almost 350 live events per year, as well as more than 330 recorded programs that can have multiple versions depending on audiences and regions. 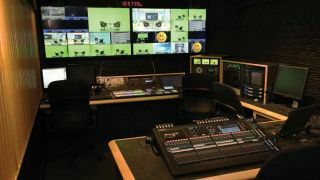 The Sunnyvale campus produces almost 350 live events per year, as well as more than 330 recorded programs that can have multiple versions depending on audiences and regions. Many events are produced in the studio, though larger events are held in the cafeteria or gymnasium (each with its own dedicated control room) to accommodate an employee audience. NetApp maintains a staff of seven people to provide AV and multimedia services in Sunnyvale through the managed services of Advanced Systems Group (ASG), a data, video, audio, and film integration firm based in Emeryville, CA. Built in 2005 with SD equipment, the studio took over conference room space on the third floor. As demand for productions grew and equipment began to fail, it became clear the studio needed to be upgraded to a full HD workflow, and ASG took on the project. Due to the physical limitations of the existing walls, the studio control room was originally built much longer than wide. Racks of routing equipment and servers filled the short far wall, audio and TD stations were positioned close together in front of the far corner, and client seats were positioned on the long, empty wall behind the switcher. The result was a cramped, noisy work area with wasted space. The ASG integration team, which included engineers within the on-site managed services group, changed the layout completely, redesigning the entire control room around production efficiency and client comfort. A new NVISION 8140 routing switcher, along with a variety of servers and other master control equipment, were moved to the adjacent Media Solutions Lab to reduce heat and noise in the control room. NetApp also invested in new technology, including the FOR-A HVS-2000 2 M/E production switcher, with 24 inputs and an easy upgrade path to 4K. The switcher’s built-in multi-view feeds two 65-inch Samsung monitors, which are large enough to be seen throughout the control room. An Allen & Heath Qu-32 digital audio mixer upgraded audio capabilities and significantly reduced the rack space devoted to audio processing. A new NVISION 8140 routing switcher, along with a variety of servers and other master control equipment, were moved to the adjacent Media Solutions Lab to reduce heat and noise in the control room. For prompter control, ASG installed an articulated Ergotron workstation, which allows access from multiple stations in the control room and simplifies operation for one or two-person crews. A new four-channel IFB allows clients or crew to speak to on-camera talent during live productions. The dedicated client space, which doubles as seating for a producer and director, offers enough desktop space for three people. Another important aspect of the upgrade was lighting. The original incandescent studio lights burned very hot, taxing an air conditioning system designed to handle an office environment. A few Kino Flo fluorescent light fixtures had been installed earlier to alleviate some of the heat, but ASG designed a new lighting scheme with a full complement of Litepanels LED Fresnels and 1x1 panels.